The purpose of spousal support is to give a lower-income spouse, who may have sacrificed income and career opportunities during the marriage, time to get back on his or her feet, and compensation for the lost income and career opportunities. In general, the shorter the marriage, the shorter the duration of spousal support. For marriages that have lasted 20 years or more, spousal support may be for life. Resentment, anger, and misunderstandings of each spouse’s rights and responsibilities can make this a very emotional and trying subject to try to resolve. It’s important to have a steady, knowledgeable professional to help you come to an agreement that will work for everyone so that the situation doesn’t deteriorate into a destructive court battle. 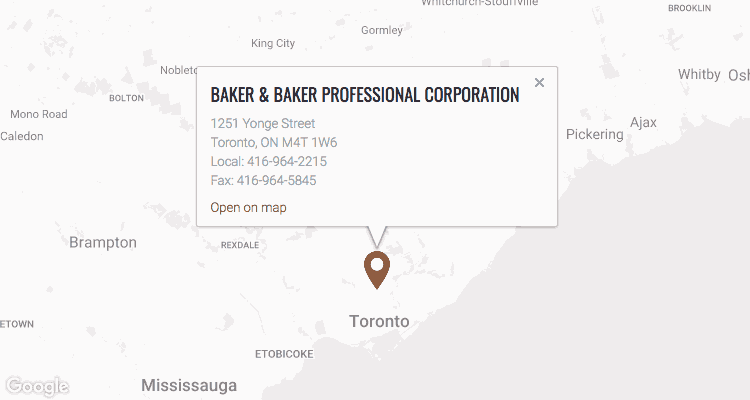 At Baker & Baker, we will begin by showing you the base range amount. Our Toronto spousal support lawyer will then help you decide where in that range your support amount should be and whether you would prefer to pay or receive a lump sum or extend payments over time. If possible we will help you resolve your issues with your spouse through negotiation and mediation, so that the solutions you come to do not take an extraordinary amount of time, effort and money to resolve. As your circumstances change, with job and income changes and possible remarriages, we will also help you with spousal support variation, ensuring that your amount of spousal support remains fair and reasonable. Looking for a Toronto spousal support lawyer? Let us help you resolve these issues fairly. Contact Baker & Baker at 416-964-2215 or by email for information.